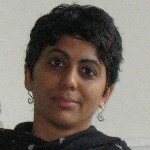 Gayatri Menon is an Assistant Professor at the School of Development, Azim Premji University (Bengaluru, India), and an Honorary Research Fellow at The University of Manchester. Gayatri is a sociologist who works on the political economy of development, focusing on urbanisation, displacement and questions of home. At ESID she works with Diana Mitlin on an India-based project examining state capacity and commitment to addressing urban poverty. Burra, S., Mitlin, D. and Menon, G. with Agarwal, I., Banarse, P., Gimonkar, S., Lobo, M., Patel, S., Rao, V. and Waghmare, M. (2018). ‘Understanding the contribution of the BSUP (JNNURM) to inclusive cities in India‘, ESID Working Paper No. 97, Manchester. Forthcoming. ‘Seeking shelter in piecemeal urban development: The grand images and timid responses of the Jawaharlal Nehru Nation Urban Renewal Mission’s (JNNURM) plans for equity in urban India’, ESID Working Paper. Manchester. With C. Caron and L. Kuritzters (2014). ‘Strengthening and clarifying land rights in disaster risk reduction and post-disaster programming’, USAID Issue Brief. Menon, G. (2013). ‘Citizens and “squatters”: The contested subject of public policy in neoliberal Mumbai’, Ethics and Social Welfare 7(2): 155-169. Special issue on ethics and social policy.